"Wolf, carnivore related to the jackal and domestic dog. Two species-and a varying number of subspecies-of wolves are recognized: the gray, or timber, wolf, once widely distributed in North America, Europe, and Asia; and the red wolf, which now occurs only in Texas and the southeastern United States. An adult timber wolf measures up to 1.6 m (6.5 ft) in length, including the tail (which is less than half the body length), and may weigh up to 80 kg (175 lb). 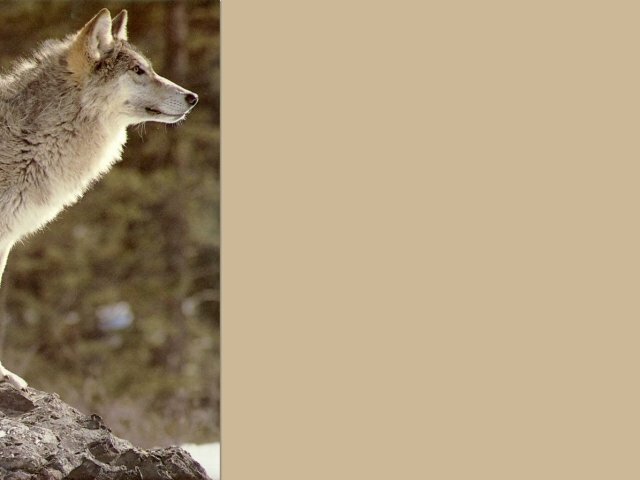 The animal is red-yellow or yellow-gray, with black patches above and white below; those in the far north, however, may be pure white, and black or brown timber wolves also occur. The red wolf is somewhat smaller in size and usually darker in color. Coyotes have hybridized with some red wolves; an attempt to reintroduce red wolves to parts of North Carolina has involved the identification of red wolves that were not part coyote. The success of this project is not yet clear. All wolves are characterized by powerful teeth, bushy tails, and round pupils, and they are distinguished from domestic dogs (some breeds of which they otherwise resemble) by certain characteristics of the skull. Wolves are equally at home on prairies, in forestlands, and on all but the highest mountains. In the winter they travel in packs in search of food. Small animals and birds are the common prey of wolves, which also eat berries, but a pack may sometimes attack reindeer, sheep, and other large mammals, usually selecting weak, old, or very young animals for easier capture. When no live prey can be found, wolves feed on carrion. The den, or lair, of the wolf may be a cave, a hollow tree trunk, a thicket, or a hole in the ground dug by the wolf. The breeding season is in the spring, and the female has a litter of one to eleven cubs. Adults sometimes feed young cubs by regurgitating food for them. The cubs normally stay with the parents until the following winter but may remain much longer. Parents and young constitute a basic pack, which establishes and defends a territory marked by urine and feces. Larger packs may also assemble, particularly in the winter; the pack leader is called the alpha male, and its mate is the alpha female. As social animals, wolves exhibit behavioral patterns that clearly communicate dominance over or submission to one another; the communal howling of a pack may serve to assemble its members, communicate with other packs, advertise its territorial claims, or simply be a source of pleasure. Visual and olfactory communication signals are also important. Although wolves are still abundant in eastern Europe and in Asia, only remnant populations now exist in western Europe, and their numbers in the Americas also have been greatly diminished. They are fairly abundant in Alaska and Canada, but remnant populations of timber wolves south of Canada occur only in Minnesota and Mexico. The decreasing numbers of wolves are the result of encroachments on their territory by humans, who have long regarded wolves as competitors for prey and as dangerous animals in themselves. The fact is that few, if any, healthy wolves have attacked humans, whom they instead try to avoid, and wolves are valuable predators in the food web. Their decimation has led to the overpopulation of a number of other animal species in various areas. There are active efforts to reintroduce wolves to national parks in the United States, although such efforts are controversial. In early 1995, the United States Fish and Wildlife Service reintroduced 14 Canadian wolves into Yellowstone National Park despite portest from ranchers and some biologists. Scientific classification: The wolf belongs to the family Canidae. The gray, or timber, wolf is classified as Canis lupus. The red wolf is classified as Canis rufus. Further Reading "Wolf," Microsoft(R) Encarta(R) 96 Encyclopedia. (c) 1993-1995 Microsoft Corporation. All rights reserved. (c) Funk & Wagnalls Corporation. All rights reserved."